Brackley Town lifted the NFA Hillier Senior Cup for the fourth time on Tuesday. Saints beat AFC Rushden & Diamonds 4-2 in a penalty shoot-out at a rain-swept Sixfields where 90 minutes failed to produce a goal. 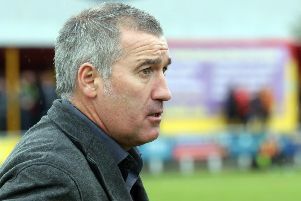 With Vanarama National League North promotion the priority for Saints, manager Kevin Wilkin fielded a much-changed line-up against the Evo-Stik League South outfit. Neither side created too many moments to excite a large crowd before late substitutions put Saints in the ascendency without finding the breakthrough. There were few chances in a quiet first half with Diamonds skipper Liam Dolman producing an excellent block to deny Ellis Myles. Diamonds went close when Nathan Hicks sent a free-kick into the area, Alex Collard headed it on and Dolman’s shot was deflected on to the post by Oran Jackson who was well placed on the line. After the restart, Shaun Jeffers shot over, Omari Sterling-Jackson twice went close, being thwarted by Ben Heath on one occasion, while Daniel Nti’s neat turn and shot forced another corner as Saints applied late pressure to break the stalemate. 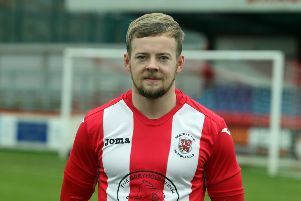 But Diamonds nearly won it when substitute Declan Rogers broke clear and rolled the ball into the path of Tom Lorraine who mis-kicked at the vital moment. The inevitable penalty shoot-out brought emphatic finishes from the spot for Saints through Alex Prosser, Nti, former Diamond Luke Fairlamb and Jimmy Armson while Rushden twice saw Danny Lewis saved well from Joe Curtis and Rogers to settle the destination of the silverware. Wilkin said: “It was a tight game, we had lots of possession but couldn’t make the break-through and you need to turn that possession into goals of course.